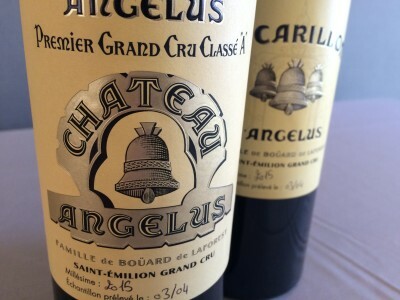 Château Angélus is surely one of the wines of the 2015 vintage. It combines beauty and lush extravagance with a degree of freshness which is wonderfully exciting. It was among the most attractive wines I tasted during primeurs week. It confirms the beauty of this vintage here in St Emilion at the top level. The fruit tones are delicious and the balance is there. The question is whether we will be able to afford the wine. Le Carillon d’Angélus is a little firmer [partly the extra Cabernet in the blend] but it is very good. 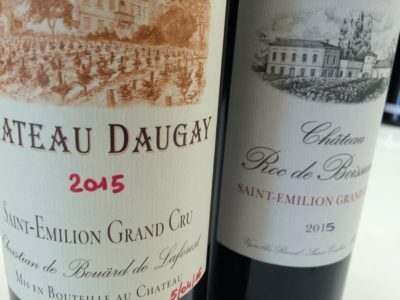 St Emilion Grand Crus Château Daugay and Château Roc de Boisseaux, properties with connections to the de Boüard family, are forward, precocious and enjoyable. I’ll discuss their Lalande de Pomerol, La Fleur de Boüard in a separate post [it is yet another beauty]. Hubert de Boüard de Laforest and his daughter Stéphanie de Boüard-Rivoal report a ‘dreamt of’ year in 2015 in St Emilion. Conditions were ideal throughout the growing season. Perfect flowering was followed by a little rain before the very hot and very dry months of June and July. The cool August with some rain was ‘timely,’ allowing for balanced ripening. Generally fine, yet cool weather in September allowed for the perfect ripening of the grape tannins. With healthy grapes they could delay picking and the vintage almost spread across a month. They describe the grapes at Angélus in 2015 as ‘magnificent’. I tasted the following wines at the property on Wednesday 6th April, 2016. The sheer beauty of Château Angélus stays in the mind. It is sublime.